WASHINGTON, D.C. – Mayor Adrian M. Fenty today gathered with the project team and city officials to celebrate the opening of the first phase of Waterfront Station, a multi-phase, transit oriented, mixed-use project in Southwest DC, incorporating new street retail, two new office buildings, new public plazas, and the newly restored 4th Street. restaurants. The first phase includes a total of 628,000 square feet. The project is being developed by Waterfront Associates, a joint venture between Forest City Washington, Inc., Bresler & Reiner, Inc. and Vornado/Charles E. Smith. The District government is the project’s anchor tenant taking 500,000 square feet – or 100% of Phase One – across two office buildings at 1100 and 1101 4th Street, Southwest. The complex is now home to more than 1,600 District employees and consolidates the offices of various agencies that include: the Department of Consumer and Regulatory Affairs (DCRA), the Office of the Chief Financial Officer (OCFO) and the Office of Planning. The new buildings offer a customer-friendly business service center for permitting and licensing. For District government operations, efficiencies are achieved through the merger of the Office of the Recorder of Deeds with its parent department, the Office of Tax and Revenue’s Real Property Tax Administration, and a connection between the Office of Revenue Analysis, the Office of Economic Development and the Office of the Chief Information Officer with other OCFO agencies. Agencies have been moving into Waterfront Station since mid-March on a rolling basis with the final move-ins by early May. Both office buildings – each 250,000 square feet – are designed to achieve at least LEED silver certification with features that include: green roof, a design that achieves maximum daylight to interior offices, use of low-emitting materials and recycled and locally-available sources. The new DC government buildings, along with 85,000 square feet of neighborhood retail line the newly restored 4th Street, SW. The stretch of 4th Street, SW between M and I Streets, Southwest was closed more than forty years ago when the site was developed as an urban mall and office complex. The right-of-way has been restored as a part of the project’s initial phase. The new 4th Street not only creates the new “Main Street” of Waterfront Station, but a new connecting artery for Southwest. Waterfront Station has also become the new neighborhood destination, with 88 percent of the first phase retail space already leased. Waterfront Station retail includes two stores that were a part of the site’s former use and have operated throughout the project’s construction phase. April 16 Safeway opened an expanded, new urban concept store to replace its former store on the site. The dynamic new 54,769 square foot store features a food court with prepared foods, a full service deli, cheese bar, bakery, sit-down sushi bar and an in-store Starbucks, all in addition to a significantly expanded grocery selection throughout the store. CVS, which was also an existing retailer on the site, will relocate from its temporary onsite location into a new 12,543 square foot store on the east side of 4th St. SW at 1100 4th Street. The new store opens this summer. In addition, several new retailers and places to eat will be locating at Waterfront Station. Subway, the popular national sub shop chain, will open in September 2010. DC-based Z Burger also plans to open a new 2,270 square foot location serving Southwest DC. An exciting new restaurant will be opening soon at the 1101 4th Street building of Waterfront Station. Station 4, a new concept from the owners of Ulah Bistro on U Street will open a stylish new restaurant of just under 4,000 square feet and have seating both indoors and outdoors on the plaza area. Station 4 is expected to open in the fall of 2010. Waterfront Cleaners, a convenient and established dry cleaning operation will also soon have a location at Waterfront Station. Information about Waterfront Station can be found at http://www.waterfrontstation.com/. After months of speculation, Subway, Station 4 restaurant, Z Burger, and Waterfront Cleaners are now officially coming to Waterfront Station! There is still room for at least three more retailers in phase one, including a bank. Update: Here is a link to a press release from Clark Construction, the general contractor of Waterfront Station, as well as a story from Fox 5 News. There's already temporary signs that show where the Subway, CVS, the cleaners and Station 4 are going. Didn't see where the Z-Burger is going. 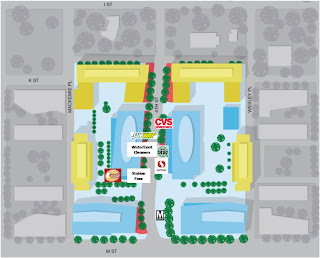 Z Burger will be located on the Southwest corner of the West building. subway is EH, but really, let's be honest, DC wouldn't know a real deli if it him them in the face. It's at least a healthy choice. It will be nice to be able to pick up a quick burger too. it'd be awesome to see a good pizzeria in the area...but again, not something DC knows well. Great! A CLEANERS! Just like the other 6! Now I can get my shirt cleaned rather on the left (@ Safeway) or right side of the street! Time to go, Caity. There must be some city worthy of your refined tastes. You will only get more bitter and twisted the longer you stay here. Seattle might be nice, if you've got the over-sized sandals. I bet you do? We desperately need a gym! Thousands of condos and no large gym in walking distance? Revenue opportunity missed. hey don't worry, I'll be out of here in two years. Just enjoying my free tuition for college. I'm from NYC area, so yes, I know good food. I know, I know...pie in the sky. one can dream, right? "We desperately need a gym!" Actually, we do have one - it used to be, anyhow, that the one in the Waterside Towers had memberships available to the community. I used them for a couple years 'til I moved to a building with a gym and rather liked them. It's not big, but it's also usually not crowded and I rather liked paddling around in their pool on cold winter evenings, looking at the snow fall. Yes, Waterside Fitness is open the public via memberships, and is also a corporate supporter of the effort to restore the park at 6th & I Streets (duck pond). Support businesses that support SW.
^^^^ Right on the money. No need for another corporate gym, unless gentrified locals with too much money to waste want a Results/Golds/WSC in the 'hood. Waterside is just fine and is an appreciated member of our community. Caity can jump in front of a Metro train for all we care. Don't let the door hit you on the way out, a-hole. A police substation? Please...there's a freaking station at Delaware and M. Are you that lazy? Rack the progression in SW. Screw the haters and those hosing the city for their own selfish gain before they go back to NY and hopefully find the business end of an armed robbery gone bad. Those wanting a gym seem to be forgetting about the Gold's Gym at 4th and D Streets S.W., in the Design Center Building.